This year I celebrated my big 4-0. In my head I’m just a 23 year old, but my birth certificate tells me otherwise. It crept up on me without me even realising and then planted a great big slap on the face upon arrival. Turning 40 is, without a doubt, a big deal. Firstly, this milestone birthday puts you in a completely different age bracket. You even get invited by the GP for a free health check, which is fine until you realise it’s available to all those aged between 40 -74!! Yes, that’s right, you now fall within the same age range as a 74 year old. What the hell? That was a flipping shock to the system. You also start to realise that there are physical changes that allude to your age. The grey hair starts to pop out, the fine lines start to appear and you start investing in every single hair care and anti-aging product you hear about. Then there’s your body [long groan]. Earlier this year when I was on holiday, I found myself looking over at this young woman on the beach. Not in a pervy/stalkerish way, but in a nostalgic way. She had a perfectly toned body, no cellulite, no signs of wear and tear. She was young and fit and I couldn’t help but reflect on how I used to look like that once upon a time. Surprisingly, it didn’t make me feel sad or depressed, but it did make me feel more aware of my age. Gone are the days of just starving myself for a day or two to lose a few pounds. Gravity now has other ideas. Turning 40 and owning it. That being said, turning 40 has brought with it a renewed sense of confidence. I find myself being bolder in my appearance and in the things that I say and do. I don’t really care what anybody else thinks and have greater self-belief in my own views and judgements. Heck, I’ve got 40 years of life experience behind me and I’ll be damned if anyone’s going to tell me what to do – just ask the Old Git. Of course it’s inevitable that you will start reassessing things in your life; what you have achieved so far and what you would still like to do. Now this could go one of two ways. You could lock yourself away in a dark room, with a box of chocolates and a hanky, and work yourself into a depression. OR you could take a break from the self-loathing and appreciate everything that you do have in your life, be it family, friends, work, your house, partner, kids or your health. Very few people have achieved everything they want in life by the age of 40. There’s still so much to look forward to and turning 40 allows you to refocus on what it is you’d really like to do. It’s a wonderful window of opportunity. 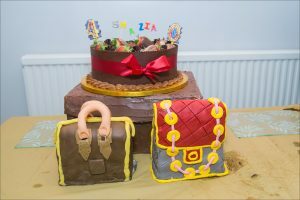 The Old Git’s attempt at making me a Louis Vuitton handbag cake for my 40th. It’s the thought that counts, I suppose..
Whatever happens, don’t be a cliché and have a midlife crisis. If you find yourself wanting to pack in your job and travel the world, leave your partner because the grass seems greener, or buy a sports car, think very carefully indeed. Many a person has made a bad decision based on a temporary state of mind. My parting pearls of wisdom are these; turning 40 really hasn’t been that bad (apart from the letter from the GP), make sure you celebrate in some way (don’t just let it slip on by unnoticed as that will depress you), be excited by the endless possibilities that lie ahead, get fit and most importantly of all, invest in some really good, expensive moisturiser.